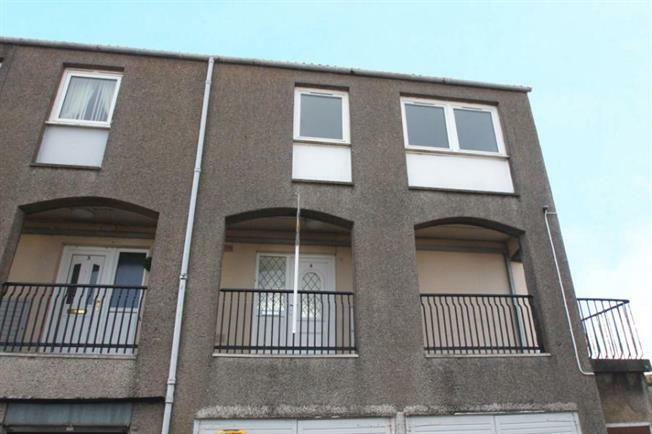 3 Bedroom End of Terrace Maisonette For Sale in Leven for Offers Over £60,000. This upper floor maisonette apartment is located within the popular "Bird Scheme" area of Buckhaven, conveniently located for local grocery store and Play Park, with other facilities including schooling found nearby. The property is presented in excellent decorative order throughout and benefits from replacement internal doors and neutral carpets. The property is accessed via an external stairwell and shared balcony. A upvc external door leads into the entrance hall providing access to the internal accommodation comprising of; lounge with an array of storage cupboards, kitchen fitted with modern base and wall units with complimentary work surfaces and breakfast bar. Integral appliances include a gas hob, electric oven and extractor hood with space for other free standing appliances and under stair storage. The stairs lead to the upper landing and to 3 bedrooms, all with built-in storage and a modern family bathroom fitted with white suite and shower over bath. Externally, there is a shared drying green and communal parking area.